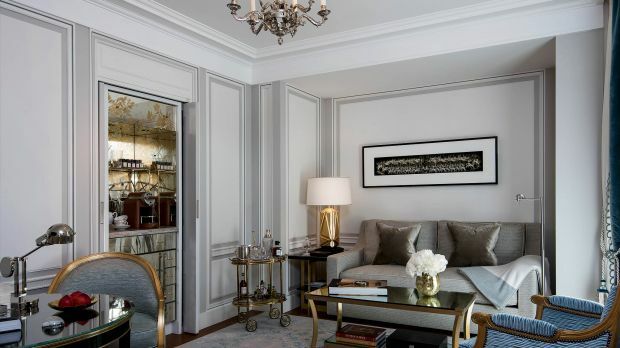 Ideally situated in the heart of Paris, Hôtel de Crillon boasts an unrivalled position overlooking Place de la Concorde. Close to the Champs-Elysées and Jardin des Tuileries, the hotel is just minutes from the city’s most iconic sites. Charles de Gaulle Airport is a 40-minute trip. Originally built in 1758, Hôtel de Crillon is a legendary palace with a history as illustrious as its architecture. Royalty, politicians, and celebrities have all graced the hotel's gilded spaces over the years, including Marie Antoinette, who once took piano lessons within a first floor salon. A recent redesign has transformed the hotel into a grand residence fit for kings and queens of the 21st century. The entrance ceilings have been lifted to make the lobby lighter, while contemporary furnishings, beautiful antiques and carefully chosen objets d’art underscore an exceptional attention to detail that can be found throughout the hotel. The 78 rooms, 36 suites and 10 signature suites strike a delicate balance between the building's 18th-century heritage and a chic, contemporary polish. While you’ll wake up feeling like royalty in all of the rooms, the Jardin, offers an enclosed terrace and a singular view of the courtyard, Cour d'Honneur. Elsewhere, multitalented chefs await to take you on an intimate gastronomic journey. Guests can enjoy authentic brasserie cuisine, irresistible treats and round-the-clock in-room dining from an inspired array of menus. Named Wow Pick of the Year in the 2019 Kiwi Collection Hotel Awards. View all winners. Send an availability request with your requested dates to the Hôtel de Crillon, a Rosewood Hotel.